When you need to find a new preacher, how do you do it? “We’ve just always invited some men in, let them preach, listen to comments from the congregation — either written or by word — then hire the man we think is the best.” That is the answer I often hear. 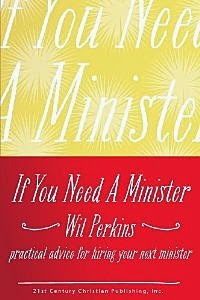 Last week, I reread If You Need a Minister: practical advice for hiring your next minister, by Will Perkins. At Maury City, we are ready to begin the preacher search. There is a training session scheduled for Sunday afternoon for the men who will be leading the selection. I obtained a copy for each man on the team. Will, in a concise way, outlines and suggests an approach that involves beginning with thinking and planning rather than just doing what we have always done. I think he has some practical suggestions that would be good to consider by any congregation looking for any minister position. You can buy this book by clicking this link: If You Need a Minister . What suggestions do you have for the selection process?